From Yūshō’s own inscription, this work was done at the request of Lord Kamei to whom it was presented as a gift. It depicts pavilions and boats on the right screen and a temple compound with a gate on the left screen. 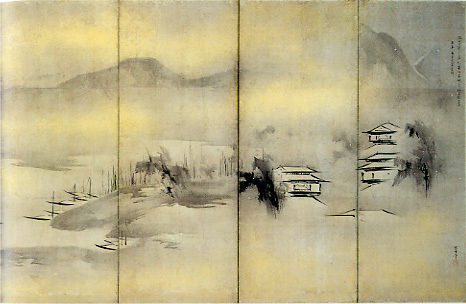 Yūshō used light ink as the base tone for the landscape and dark ink to highlight buildings and trees bringing in sharpness to the picture. This is the ultimate monochrome landscape painting accomplished by Yūshō.